T-R PHOTO BY THORN COMPTON – The Marshalltown boys swim team state qualifiers pose by the pool at MHS during a practice before the state meet. 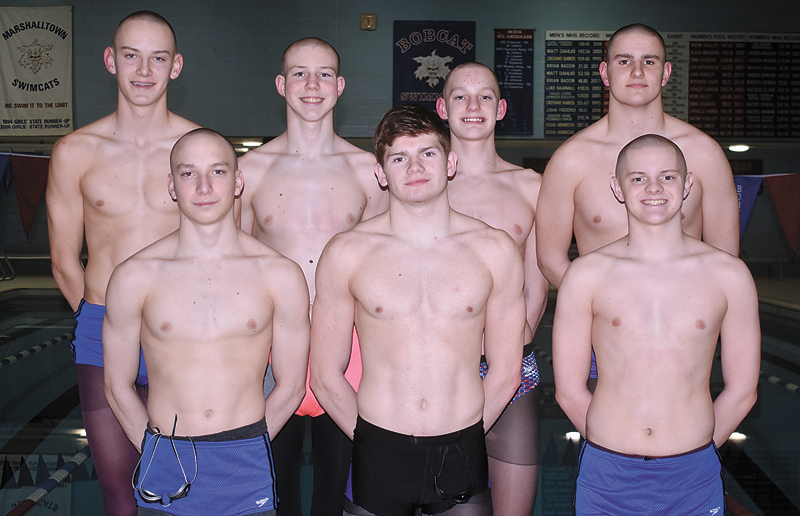 The swimmers are, from left, bottom row: Nash Perisho, Ryne Downey and Caleb Summers; top row: Aaron Seberger, Bryce Edens, Marcus Barker and Carson Beals. Last season the Marshalltown boys swimming team returned to the state tournament after missing out on qualifications the two prior years. Just a season later the Bobcats aren’t just heading back to the Iowa High School Boys State Swimming Championships in Iowa City on Saturday, they are doing so with their biggest group of qualifiers in more than a decade. MHS has nine total qualifications in six different events preparing to swim at the University of Iowa Campus Recreation and Wellness Center, and head coach Mike Loupee said though that’s the most since having nine qualifications in 2006 and 2007, it’s not a surprise after the season his team had. Four individuals and two relay teams make up the nine qualifications for the Marshalltown. Juniors Carson Beals and Nash Perisho and freshman Bryce Edens are all qualified in two individual events. All three will represent the Bobcats in the 200-yard freestyle, with Perisho seeded 14th, Beals seeded 15th and Edens seeded 21st. Perisho is also in the 100 butterfly, seeded 20th, Beals is the 15th seed in the 100 freestyle and Edens is seeded 13th in the 500 freestyle. Senior Ryne Downey had one qualification, as he is seeded 10th in the 100 freestyle. The 200 and 400 freestyle relay teams are both headed back to state for a second-straight year as well. The 200 freestyle relay team of Downey, Perisho, Beals and freshman Marcus Barker swam a new-school record time of 1:27.75 to enter as the fifth seed. The 400 freestyle relay team just missed a school record by half a second, and it is seeded 10th. Of the five individuals who will be swimming for Marshalltown, three in Downey, Beals and Perisho were qualifiers last year, which Loupee said is great both for their preparation and for bringing the freshmen up to speed. Beals agreed with his coach that the experience he got as a sophomore has already made his preparation better. Downey said he also benefits from a couple of extra trips to Iowa City to compete in the pool on the University of Iowa campus this offseason. Not only do a good portion of the swimmers know how to handle the pressure of a state meet, Loupee said he and the coaching staff also benefit from having been to Iowa City last year in the state meet’s first year back on the University of Iowa campus. Perisho had a breakout season this year for the Bobcats. He went from not qualifying in anything individually a season ago to coming in with four qualifications, as he is on both relay teams as well as his spots in the 200 freestyle and 100 butterfly. “It’s been really crazy to think I’ve come so far since freshman year. I just have no words for it,” Perisho said. Loupee wasn’t surprised by the growth of Perisho, however, as he has done everything the coaching staff has suggested and then some. Perisho is the first 100 butterfly qualifier for the Bobcats since Aaron Gervich in 2006, and his seed time of 54.26 is just under two seconds away from the school record held by Matt Dahlke of 52.50. “Since I’m already close to the record in the fly I might as well try to get it on Saturday, and in the 200 I want to get a faster time,” Perisho said. Beals was a qualifier in the 100 freestyle a season ago, but he didn’t quite have a second event that was strong enough to get to state. That wasn’t the case this season as he has excelled in the 200 freestyle as well as the 100. Loupee said it’s Beals’ constant attention to detail that makes him successful. As for his goals heading to his second state meet, Beals said his main focus is seeing his times continue to go down. Downey was a state qualifier in the 50 and 100 freestyle in 2018, but he had a tough showing in the 50 freestyle at the district meet and missed a return to state in the race he focuses on most. Instead of letting that get him down, Downey bounced back and swam a 47.93 for the 10th fastest time in the state in the 100 freestyle, something Loupee said was great to see. Downey’s eyes have been set on breaking the 50 freestyle school record of 21.33, held by Brian Bacon, and he will still get a chance to break that mark when he leads off the 200 freestyle relay. In fact, he said not qualifying for the open 50 free might actually be a blessing for his bid for a school record. Edens is already one of the top 15 swimmers in the state in the 500 freestyle as a freshman, and Loupee said there’s almost no ceiling on what Edens can accomplish in his career. Heading into his first taste of action at the state meet, Edens said he is ready to soak it all in. Like Edens, Loupee said Barker has all the tools to be an outstanding swimmer. Barker just missed out on qualifying individually in the 200 individual medley and the 100 freestyle, and Loupee is also excited for his future. Barker said he is excited to see how everything works at the state meet from the competitor side. After such a great season, going 9-2 in duals and earning the most state qualifiers in 12 years, Loupee said he really isn’t all that worried about his guys showing up and performing well on Saturday. The Bobcats will compete in the Iowa High School Boys State Swimming Championships on the University of Iowa Campus on Saturday, starting at noon.